Hambledon Parish Council has given its conditional support to a planning application to build nine houses, seven of them affordable, at Orchard Farm, Wormley Lane. At its monthly meeting on Tuesday (April 2) councillors were unanimous in agreeing its response to Waverley Borough Council which, as the local planning authority, will determine the application. English Rural Housing Association is seeking approval for a scheme to build seven 1, 2 and 3-bedroom properties for affordable rent or shared ownership and two open-market bungalows. Priority will be given to local people with a connection to Hambledon. This application follows the rejection of a previous proposal to build 17 homes – 12 affordable and 5 market – on the site, which occupies land between Wormley Lane and Petworth Road. In its response, Hambledon Parish Council stated that it continued to support the provision of affordable housing in the village and noted the reduction in the size of the proposed development, which is on land within the Green Belt and the Surrey Hills Area of Outstanding Natural Beauty. Waverley would need to determine whether the proposal satisfies the requirements for it to be considered a rural exception site. 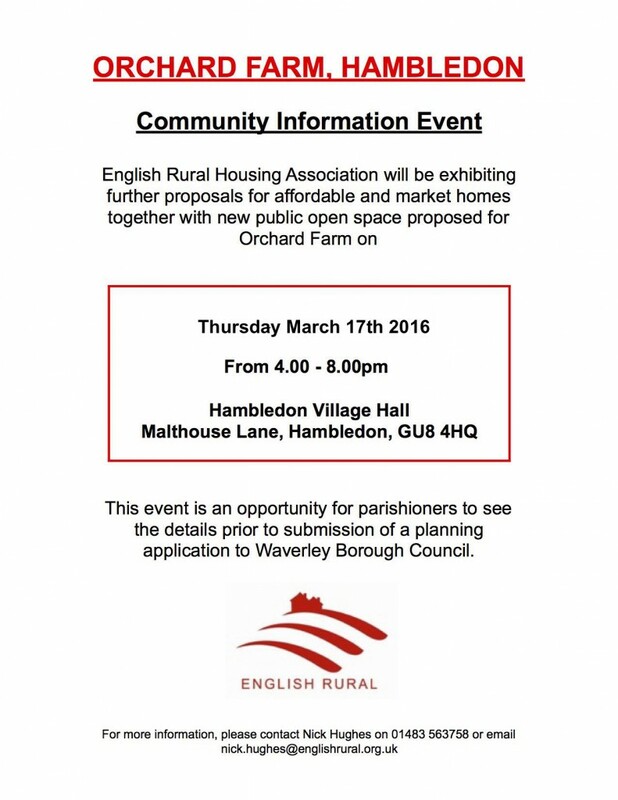 Hambledon Parish Council will consider its response to the new application by the English Rural Housing Association to build seven affordable and two market-price homes at Orchard Farm, Wormley Lane, at its monthly meeting tomorrow evening (Tuesday April 2nd, 2019). The meeting starts at 8pm at Hambledon Village Hall. The application will be discussed at the planning section of the meeting. Anyone who wishes to raise issues about the application, or any other matter, is invited to do so at the start of the meeting when 15 minutes are set aside for questions from members of the public. The response will be sent to Waverley Borough Council, which will determine the outcome of the application. 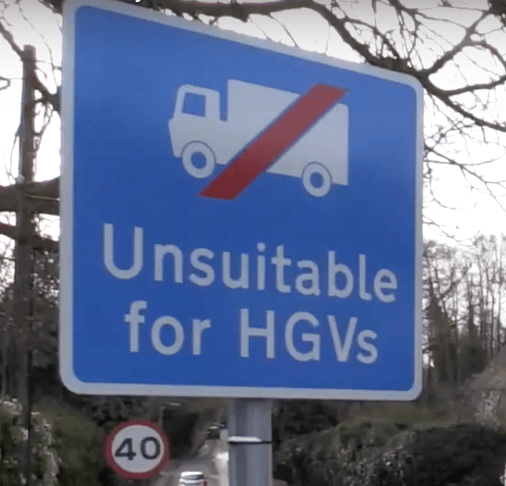 Surrey County Council has been told that its cabinet member in charge of highways must be called to address issues of safety, rat-running and heavy goods vehicles on the narrow cut-through of Salt Lane at Hydestile. In what is a significant achievement for local resident and campaigner Paul Osborne, a joint meeting of county and Waverley Borough councillors agreed that further consideration should be given to measures to mitigate the increase in traffic along the cut-through route of Station Lane, Hydestile Crossroads, Salt Lane and Markwick Lane. Paul had successfully petitioned to have the issue added to the agenda of the SCC Waverley Local Committee meeting held on March 22nd. He needed 30 signatures before SCC would agree. 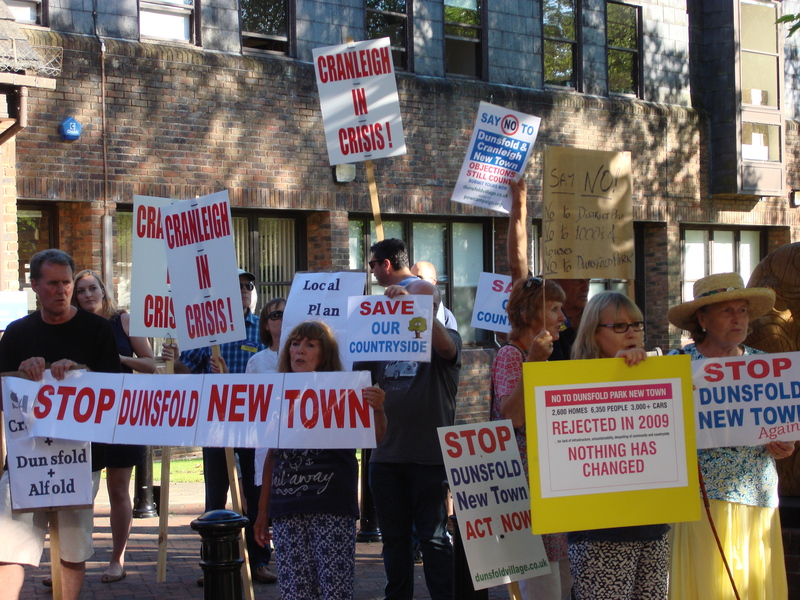 In the event he had 251, most of them Hambledon and Hydestile residents, which demonstrated the extent of concern about the east-west route linking the A3 and Milford Station with Dunsfold Park, the A281 and Cranleigh. 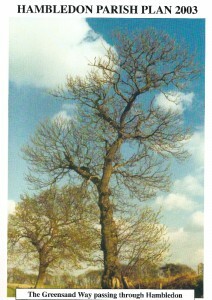 In a powerful video presentation, seen by committee members before the debate, Paul sought to demonstrate how a narrow, rural lane with passing places was already at beyond capacity, and the problem would only get worse with the prospect of major new housing at Dunsfold Aerodrome together with others at Milford Golf Course, Milford Hospital and in and around Cranleigh. For those of you that signed the Surrey CC petition on traffic issues on Salt Lane you may be interested to hear that as a result this matter is now to be discussed at the Surrey County Council Local Committee at Waverley Borough Council chamber at 10am on Friday 22nd. This will be webcast and the public can attend. A video overview will be shown to the committee Councillors beforehand. Councillor Victoria Young and Surrey Hills have been supportive in this matter. The video, traffic survey data and photographs can be seen here. Hambledon Parish Council has been approached by a concerned resident wanting to know if it is responsible for an anonymous document that has been delivered to some households in the village expressing opinions about the new planning application for affordable homes at Orchard Farm. The parish council is NOT responsible for this document, which is headed “Briefing Note to Local Residents”. The resident contacted the parish clerk to express anger that the document appears to be biased, is not on headed notepaper, and is unsigned and unsolicited. The resident added that whoever is behind the document should have the courtesy to sign it. In response the clerk has reassured the resident that the document has nothing to do with the parish council. The council is currently considering the application and has informed Waverley Borough Council that it will comment on it once it has the opportunity to discuss it at its next monthly meeting in early April. A revised planning application to build affordable and market price homes at Orchard Farm has been submitted to Waverley Borough Council by the English Rural Housing Association. The new application is seeking approval for a scaled-down development of seven affordable homes together with two bungalows to be sold on the open market. The previous ERHA application, submitted in 2016, was for 17 homes – 12 affordable and five open market. This was rejected by Waverley councillors in May 2017. The ERHA went to appeal but this was dismissed by the Planning Inspectorate in June 2018. The new application was made public on the Waverley Borough Council website on Monday (March 4th, 2019). A deadline of March 29th has been set for comments. The new development, if approved, would occupy the area of previously developed land at Orchard Farm, Wormley Lane, where various outbuildings currently stand. Five of the new properties would be for affordable rent and two for shared ownership. Under the revised scheme the original farmhouse, which was to have been demolished, will be retained, renovated and sold on the open market. This does not form a part of the new application. Paddock land, which was to have been gifted to the village as open space under the previous scheme, is now excluded from the application and is not a part of the latest proposal. Orchard Farm is within the Green Belt and the Surrey Hills Area of Outstanding Natural Beauty and the ERHA application will need to demonstrate that the land may be considered as a rural exception site. Hambledon Parish Council, which held its monthly meeting the day after the application was published, had no opportunity to consider the application in detail. Its next meeting is April 2nd, after the comment deadline. Therefore, the parish council resolved to request an extension to the comment period in order to examine the proposal in detail and to hear any comments from villagers before responding to Waverley Borough Council. People with connections to Hambledon and who fulfill ERHA criteria will have the opportunity to apply to be considered for the affordable homes if approval is given to the development. The parish council can comment on the application, but it is for Waverley Borough Council to approve or reject the proposal. 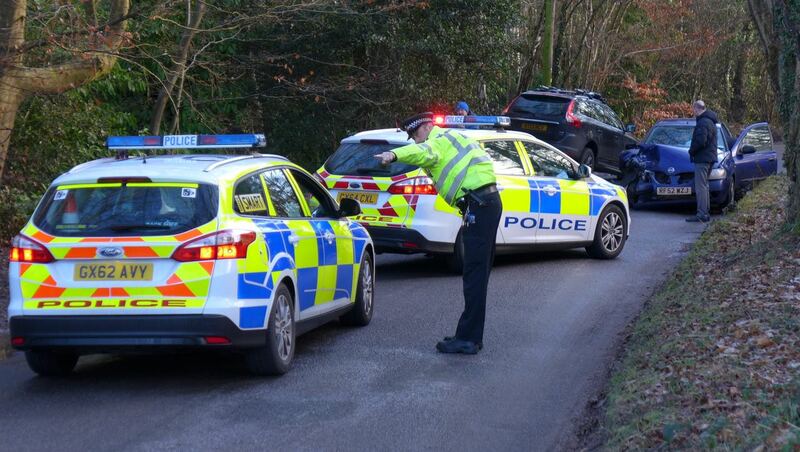 For the second day running there has been a crash at the Hydestile Crossroads, and another collision just a few hundred yards away has completely blocked Salt Lane which is now closed to traffic. Police closed Salt Lane at its junction with the crossroads to all traffic at around 9am today (Wednesday January 30th). It is closed along its entire length to Markwick Lane and beyond to Loxhill. The crash at the crossroads itself involved two vehicles, and was relatively minor. The crossroads, and its approach down Salt Lane, is covered in ice and road conditions are treacherous. 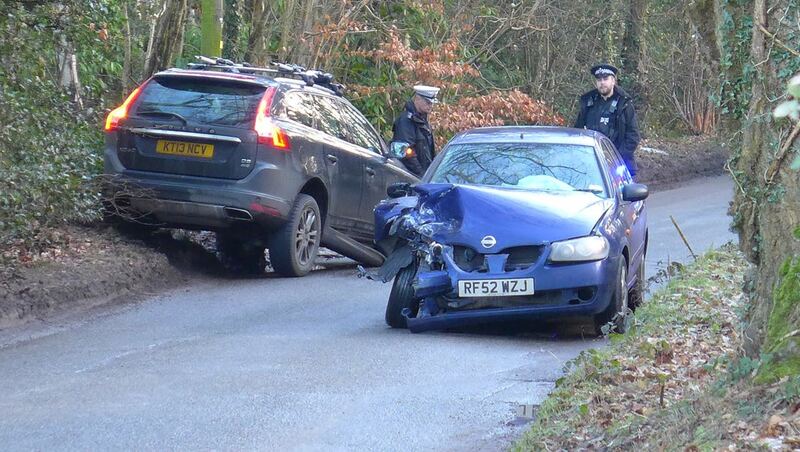 The second accident was more serious as it has blocked the narrow, rural lane just above New Road. Two cars, traveling in opposite directions, have collided. Injuries appear to be minor. Police are in attendance. 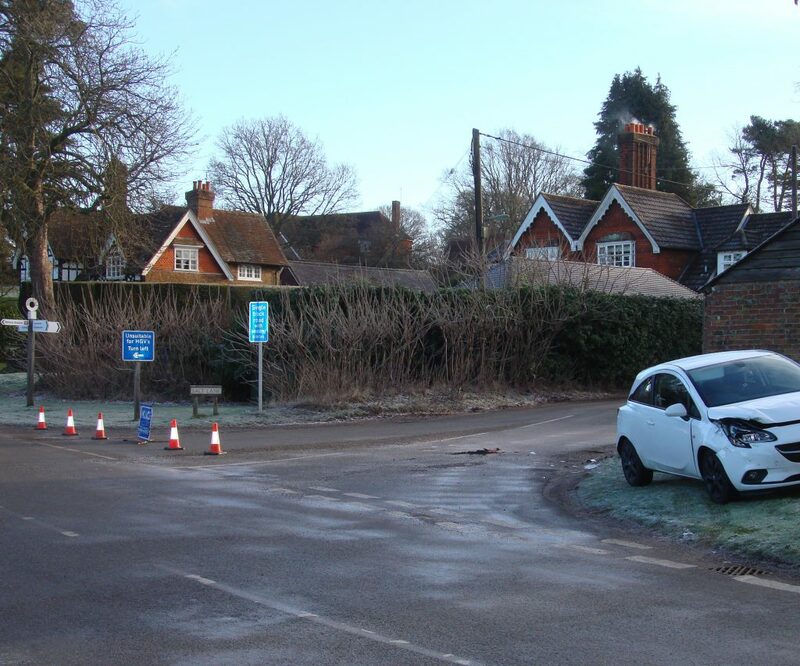 As with the crossroads crash yesterday (see earlier news report), icy conditions are likely to have played a part. 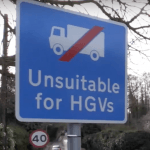 But it emphasises the need for Surrey County Council Highways Department to pay heed to the initiatives suggested by Hambledon Parish Council to tackle road safety in the village and its outlying rural lanes. Salt Lane, on the Hambledon parish boundary is used by many as a cut-through between the A281 and the A3. 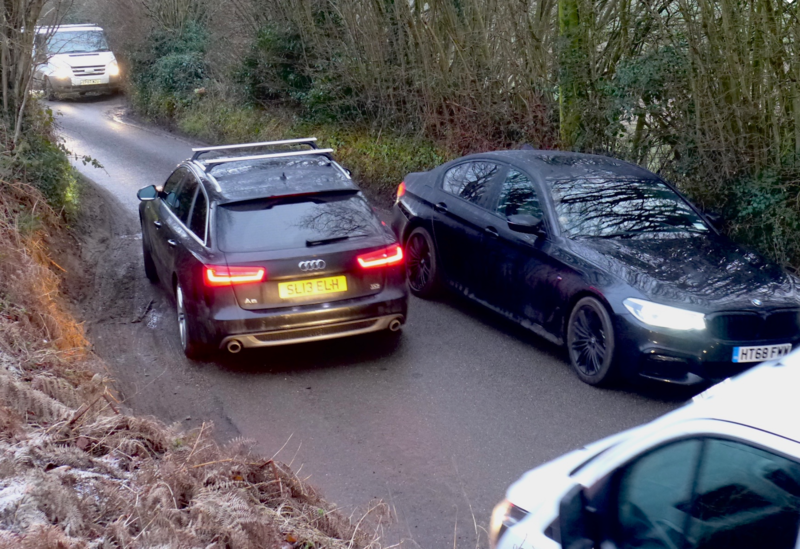 With the likelihood of a major new housing development at Dunsfold, this narrow lane with passing places will inevitably become even more congested. As for the crossroads at Hydestile, this has been regarded by locals as an accident black spot for many years and the parish council is in discussions with the highways authority and police to try to implement road safety measures along the length of Hambledon Road, from the Hydestile approach and though the village to Lane End. 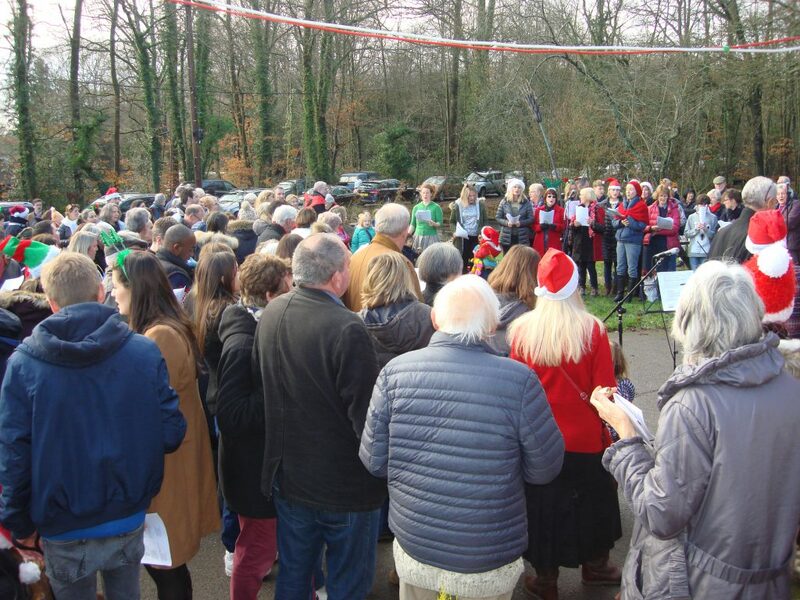 Hambledon residents turned out in large numbers at noon on Christmas Eve to join in the community singing of carols and seasonal songs outside the village shop. 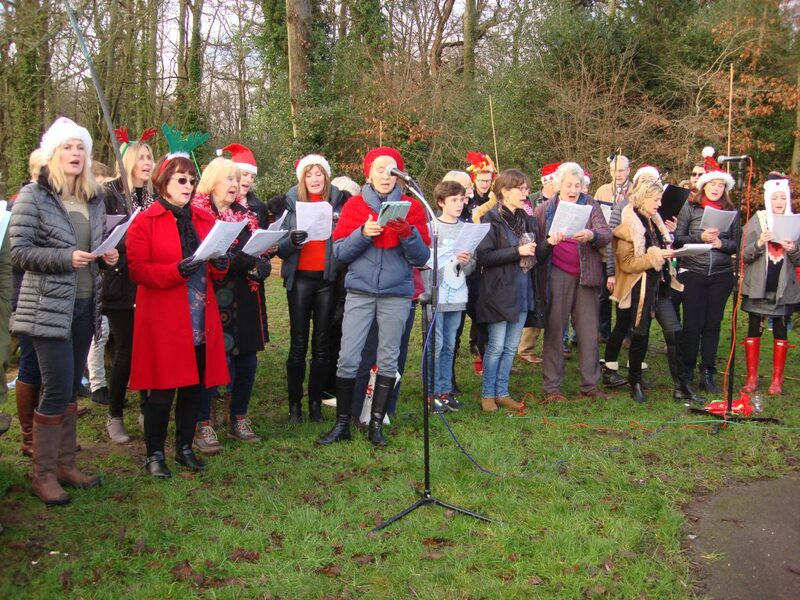 A big thank-you goes to the organisers, the shop choir and to David Kirby and his musician friends for a wonderful and harmonious festive gathering. The day before, Mic Coleman, who for so many years has been a stalwart of village activities, celebrated his 90th birthday. He and Sylvia had a busy day as friends dropped by to pass on their best wishes before a large family gathering later in the day. Mic has worked tirelessly for the village football and cricket teams, becoming president of both. He has been involved in the running of the village hall, the village fete and the produce show. 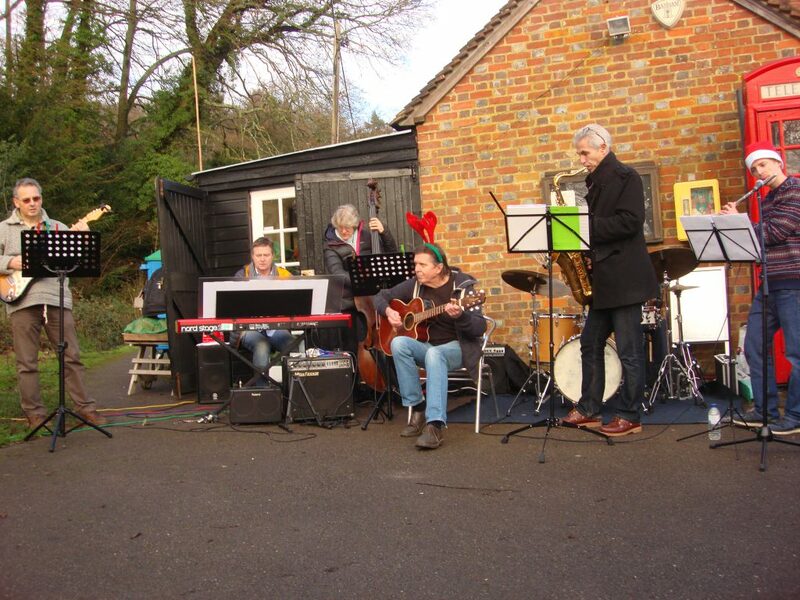 He is also a former chairman of Hambledon Parish Council. 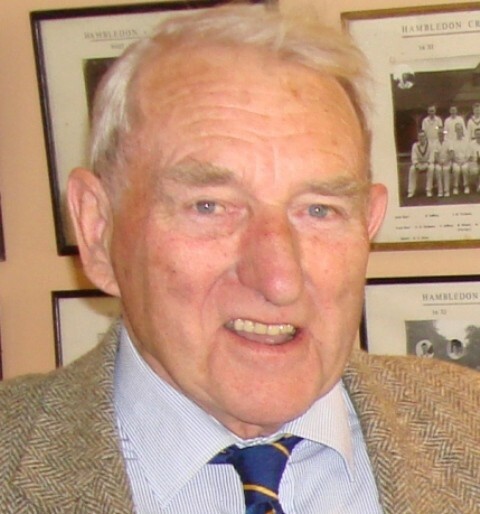 In 2012 he was awarded the British Empire Medal in the Queen’s Jubilee Birthday Honors “for services to sport and the community in Hambledon”. Mic has done so much for the good of the village and its residents and we all wish him the very best for the future. And the Web Team sign off by sending its best wishes to all. 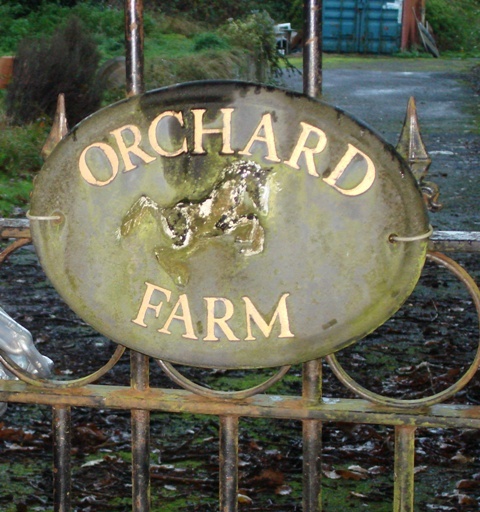 What Next For Orchard Farm? The proposal to build affordable homes at Orchard Farm has been rejected on appeal and developers English Rural Housing Association must now decide whether to re-apply with a scaled-down application or sell the site on. 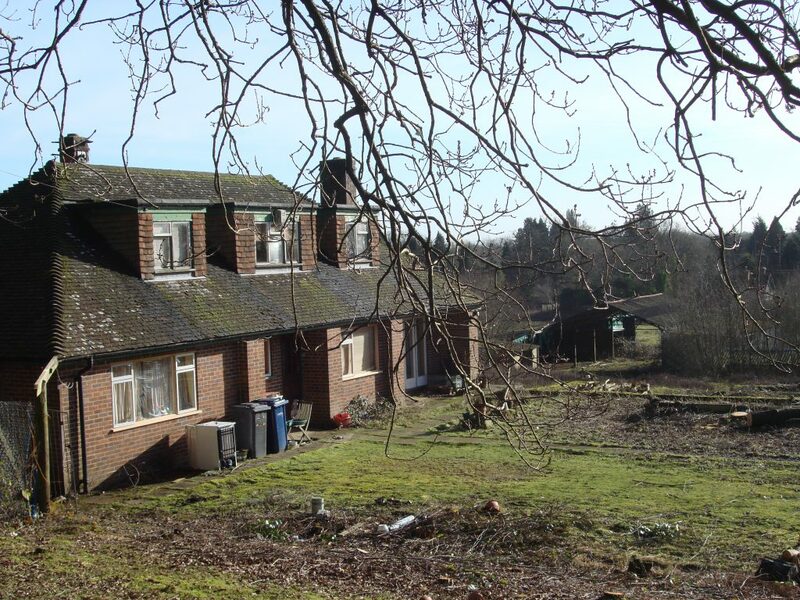 The ERHA had applied to demolish the existing farmhouse and outbuildings and build 12 affordable homes together with five larger market-price houses and provision of open space for village use. After much local consultation, and with concerns expressed over the size of t he proposed development and drainage issues, the application went before Waverley Borough Council in May last year where members voted to reject the scheme. The nine-acre site between Petworth Road and Wormley Lane is within the Green Belt and the Surrey Hills Area of Outstanding Natural Beauty. Waverley councillors said that no special circumstances existed in the application to outweigh the harm to the Green Belt and the AONB. After considering the outcome for several months, ERHA decided to lodge an appeal to the Government’s Planning Inspectorate. This appeal has now been considered and dismissed, upholding the original decision by Waverley Borough Councillors. Sheila Holden, the inspector appointed by the Secretary of State to consider the appeal, said in her ruling: “Notwithstanding the continued need to provide affordable homes, the supply of housing land is not a factor weighing in this scheme’s favour”, adding that the proposal would be an “inappropriate development within the Green Belt”. The ERHA, which is a registered provider of social housing in rural areas, has not commented on what it will do next. It bought the site on the open market and had hoped that the provision of market-price houses in the scheme would help pay for the affordable homes, which would have been available for rent or shared ownership at below market costs. It may return with a smaller scale development of affordable homes only as the inspector’s ruling seems to indicate that market price properties are unacceptable and do not meet the criteria for exempting the site from Green Belt and AONB restrictions. Or it could consider putting the land, together with the existing farmhouse, back on the open market. Hambledon Parish Council remains committed to attempting to find suitable sites for affordable housing in the village in accordance with wishes expressed by residents and contained within the published Parish Plan. 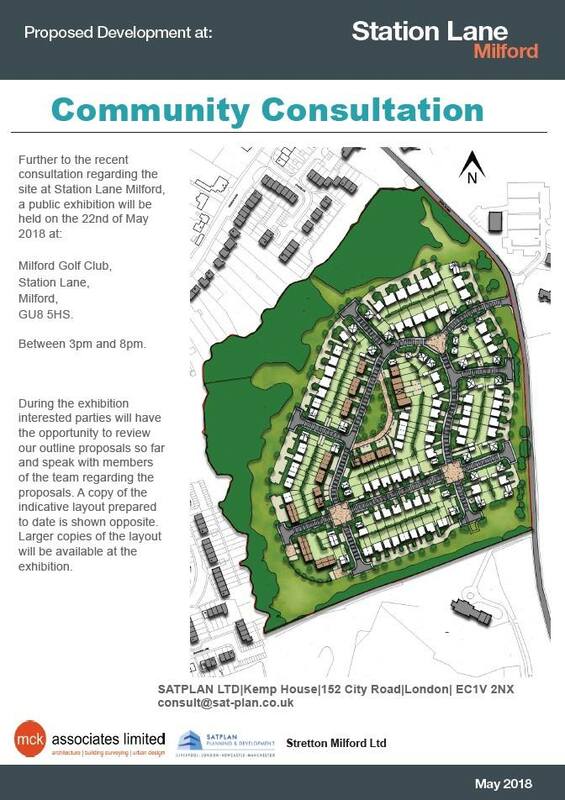 The developers of Milford Golf Course are holding an exhibition with an outline of the proposed 180 home re-development of the Golf Course on the South side of Station Lane. With Station Lane and Milford crossroads already congested at peak times, such a development will put pressure on the infrastructure in our area. With the prospect of the doubling of traffic on this road once Dunsfold Park is built it is vital that residents make their views on record at this exhibition. All are invited to view on Tuesday 22nd between 3pm and 8pm at the Golf Club in Station Lane. Waverley Borough councillors have rejected a planning application to build 17 houses – 12 of them designated as “affordable” – at Orchard Farm, Hambledon. The decision was taken at a meeting of the council’s Central Area Planning Committee on Wednesday evening (May 17). The application had been submitted by the English Rural Housing Association (ERHA) which had proposed a mixed development of 12 affordable homes, together with five market-price properties to help finance the project. This followed ERHA’s purchase of the nine-acre Orchard Farm site between Wormley Lane and Petworth Road, Hambledon, in 2014. Hambledon Parish Council has a long-standing commitment to provide more affordable housing for local people. However, the proposed development, on land within the Green Belt and the Surrey Hills Area of Outstanding Natural Beauty raised many issues. Drainage and its proximity to Listed Lutyens buildings were among other concerns. The parish council initiated widespread consultation including public meetings. Although there was general support from the wider village there were many concerns expressed by those living close to the site. The decision on whether to approve or reject the application is the responsibility of the local planning authority, Waverley Borough Council. Its officers had recommended approval of the scheme, subject to a raft of conditions. No very special circumstances exist to outweigh the harm to the Green Belt, contrary to Policy C1 of the Waverley Borough Local Plan. No very special circumstances exist to outweigh the harm to the AONB, contrary to Policy C3 of the Waverley Borough Local Plan. The less than substantial harm to the setting of the Grade I Listed Building is not outweighed by public benefits. Therefore the proposal would conflict with Policy HE3 of the Waverley Borough Local Plan, and guidance contained in the NPPF. The applicant has failed to enter into a legal agreement to secure the provision of affordable housing within the meaning of the NPPF, appropriate to meet Waverley Borough Council’s housing need. The proposal would therefore fail to create a sustainable, inclusive and mixed community, contrary to the requirements of paragraph 50 of the NPPF. The applicant has also failed to enter into a s.278 agreement. The planning application submitted by English Rural Housing Association to build 17 affordable and market price homes at Orchard Farm is expected to be considered by Waverley Borough Council next month. ERHA is seeking permission to build 12 affordable houses – which would comprise a mix of shared ownership and rental properties – and five open market houses on the site at Lane End between Wormley Lane and Petworth Road. The site is within the Green Belt and in the Surrey Hills Area of Outstanding Natural Beauty. Waverley must decide if the site meets the criteria to be regarded as a “rural exception site”, a policy which allows for limited development on Green Belt land. Management and responsibility for the Open Space. Surrey County Council has also recommended that Waverley refuse the application, expressing concerns over drainage issues. The Surrey Hills Board and the Campaign to Protect Rural England are among other bodies and organisations objecting to the scheme. A decision on the application will be made by Waverley Borough councillors. A target date of November 10th has been given, but this may not be met. The English Rural Housing Association planning application has finally been submitted seeking permission to build 17 affordable and market price homes on the Orchard Farm site and it is important to hear the views of villagers before the Parish Council considers the issue. This is a reminder that a meeting is to be held this Tuesday (September 13) at the Village Hall at 8pm and it is hoped that as many people as possible will attend so that opinions from across the parish can be heard. The Parish Council held one open meeting when the ERHA first made its proposals known after acquiring the Wormley Lane/Petworth Road site in 2014. Now that a planning application for 12 affordable and five market price houses has been submitted to Waverley Borough Council the latest meeting is to hear from villagers before the Parish Council comments on the application. The application can be found by clicking here. Waverley Borough councillors have overwhelmingly supported a recommendation that its new draft Local Plan be published. 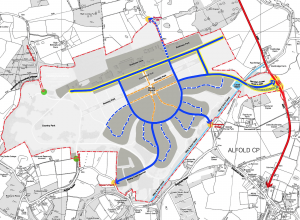 The plan, which sets out a strategy for housing up until 2032, allows for 2,600 homes to be built on the site of Dunsfold aerodrome. Local parish councils, including Hambledon, have expressed grave concerns that unless sufficient infrastructure is in place, a “new town” development at Dunsfold is not sustainable. A meeting of the full Waverley council on Tuesday night was picketed by protesters who chanted and waved banners in protest at the Plan as members arrived at the council offices in Godalming. They were being asked to agree to a recommendation by the council’s executive that the draft Plan be formally published to allow it to move on to the next stage – a minimum six-week period for representations to be made before it is submitted for examination by a Government planning inspector (see previous news item). Three councillors abstained. Many others thought it flawed but voted in favour to prevent central Government taking it over and imposing its own targets. To avoid this outcome the Plan has to be in place by early 2017. Waverley’s earlier attempt at a Local Plan was rejected by a Government inspector for not having met new housing targets. The owner of the airfield, Dunsfold Park Ltd, is currently applying to build 1,800 homes on the site, potentially rising to 3,400. Hambledon and other local parishes in the area are concerned about the impact such a significant new housing development will have on narrow, rural lanes that surround the airfield site. The only major road in the area is the A281 which is already heavily congested at peak times in the Guildford direction. It is argued that people will look to “rat-run” on unsuitable single-track country lanes such as Markwick Lane, Salt Lane and Vann Lane to reach Witley and Milford stations, schools and surgeries, all of which are already stretched to meet existing local need. Hambledon Parish Council has objected to the current Dunsfold Park application on the basis of a lack of supporting infrastructure. It accepts the need for new homes but said the current proposals would put “severe and unacceptable pressure on an already overstretched transport network”. The council has suggested that the planners and developers should consider reinstating the former Guildford to Cranleigh railway line – with a spur to Dunsfold – as a light transit system to help alleviate road congestion, if development goes ahead. If you would like to read what comments Hambledon Parish Council has made to Waverley on the Dunsfold application so far, please follow this link ,- and then click on Dunsfold Park. Further comment is likely when final plans are known. In the meantime parishes and the campaign group Protect Our Waverley (POW) will be keeping up the pressure on councillors when they come to consider the planning application and during the representation stage of the draft Local Plan. 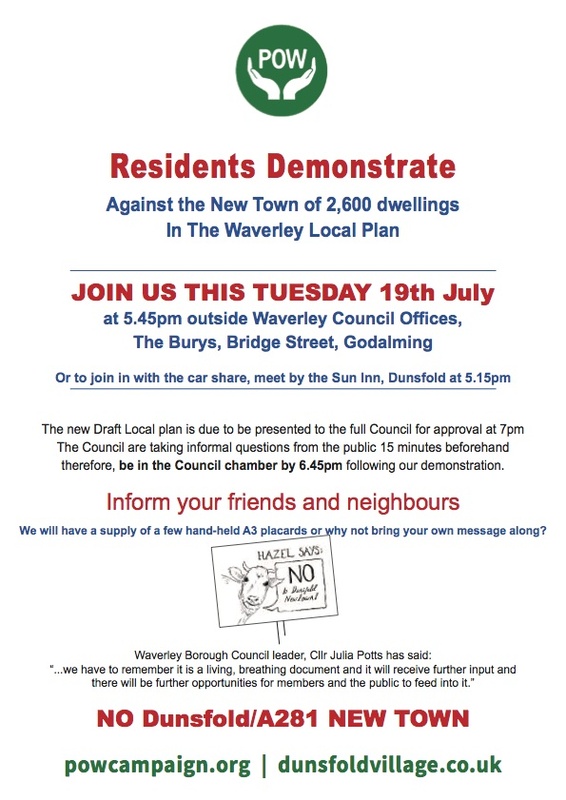 A “new town” of 2,600 houses at Dunsfold Aerodrome is among proposals in the new draft Local Plan to be considered by Waverley Borough Council tonight (Tuesday July 19). The airfield site is already subject to a planning application for 1,800 homes and this total will inevitably rise if the new Local Plan is adopted. Dunsfold Park, owners of the site, has suggested that eventually up to 3,400 houses could be built. Hambledon Parish Council has objected to the application and has joined with other parishes in the area in arguing that narrow country lanes will not be able to cope with the additional traffic. The only major road near the site, the A281, is already at a standstill at peak times. To avoid this new home owners will be forced to “rat-run” by using single-track rural roads such as Markwick Lane, Salt Lane and Vann Lane to reach Milford and Witley stations, schools, shops and places of work. If Waverley adopts the new Local Plan, efforts to fight the Dunsfold Park proposals will be seriously undermined. In 2009 Waverley refused a similar housing application for the site, upheld by a Government inspector on appeal. Today, although reasons for objecting remain the same, Waverley is under central Government pressure to build more than 500 new homes across the borough every year to 2032. Waverley’s executive has already recommended the new Local Plan be formally published and the full council meets tonight at 7pm to consider endorsing this recommendation. If this happens there will be a minimum six-week for representations before the plan is submitted for examination by a Government Planning Inspector. Protect Our Waverley, a campaign group set up to fight the proposals, will be staging a demonstration outside Waverley offices before tonight’s meeting. In 2003 Hambledon produced a Parish Plan to help shape its future. Since then the Parish Council has examined various other formal frameworks to ensure the village’s ambitions for the years ahead are taken into account by Waverley Borough Council and other authorities. These have included producing a Village Design Statement and Neighbourhood Plan, a route which some villagers had asked the council to consider. After seeking professional advice – and taking into account the cost and resources necessary for such measures – it was decided that there were insufficient benefits to justify the time and money involved. Instead it considered producing a Community Plan, which is smaller in scope that a Neighbourhood Plan and arguably more relevant to a little rural village. Whichever method the parish council adopted for drawing up a blueprint for the future, it would require financial assistance and community volunteers. In the event neither was forthcoming. It was hoped that funding for a Community Plan would be awarded by the Big Lottery Fund and that sufficient villagers would volunteer to participate in its preparation. The second set back was that one month after an appeal for volunteers appeared in the Parish Magazine and on the village website only six responses had been received. So it’s back to the drawing board. Although there have been changes since Hambledon produced its Parish Plan in 2003, it would be difficult to improve on its objectives. The Parish Council has therefore decided to continue using it as a base document but to up-date it and re-issue it, either in its existing form or in a new format and perhaps with a more appropriate title. Village organisations and individuals are therefore being asked what would make Hambledon a better place for them and their activities. The responses will be incorporated in a discussion paper which will be made widely available early in April. The paper will then be discussed and questions arising from it addressed at the Parish Assembly on 16 April. Funds for printing the completed plan have been included in the 2016-17 budget. It will also be available on the village web site. So, in thanking those who did volunteer to help with a Community Plan, the Parish Council now asks them and as many other villagers as possible to give some thought as to what they think would make Hambledon an even better place in which to live. Please make sure that comments are either posted by leaving a comment on this article, or sent to the Clerk by 15 March so that they can be included in the discussion document. Last chance for Cricket Camp!